Except the two free CDs: Itashi & Sasuke from Naruto. CD cases are original from Japan but the discs inside are burned CD soundtracks. Note: These CDs are produced for Asian markets. The 2 CDs (Faye Wong & Utada Hikaru) on the top left hand are 8cm diameter CD - out of print now. FREE shipping within Singapore only for paid CDs. For FREE CDs only, you will need to add S$0.50 for the postage. If you're getting the paid & FREE CDs together, it's FREE shipping. Note: Bottom right corner Fushigi Yuugi CDs are 8cm diameter CDs - out of print. All payment by bank transfer. No meetups. If you need larger view of the photos, I can e-mail to you. Please feel free to contact me for any enquiries. 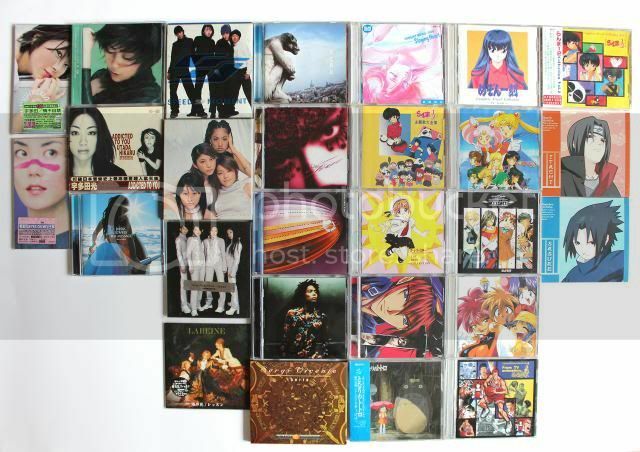 WTS: J-POP CDs, Anime (FFVII:AC, Studio Ghibli, Cardcaptor Sakura) & MORE! SGD$5 ONWARDS!